Known internationally as one of the world’s best scuba diving destinations, Maldives has an abundance of dive sites with a unique underwater beauty to explore. The islands of the Maldives have consistently warm waters with outstanding visibility throughout the year, and consist of exhilarating dive sites such as vibrant thilas, exciting channels, coral-filled overhangs and fascinating wrecks. Maldives’ world-renowned coral reefs play a fundamental role in food production, shoreline protection, and tourism revenue, but ocean plastic threatens the survival of shallow coral reefs. Preservation of the reefs has become more important than ever. In 1998, a severe El Niño event resulted in unusually warm waters (3-4 °C) above normal. This caused a mass bleaching and die off of Maldivian coral reefs. Just as recovery reached its peak, another El Niño hit. The 2015-2016 El Niño weather phenomena and associated sea surface temperature anomalies in 2016 caused one of the largest recorded episodes of mass bleaching in the Maldives. A subsequent survey of 71 sites across the Maldives conducted by IUCN found that 73 per cent of corals had undergone bleaching, indicating a severe bleaching event. Being one of the new additions to the vast collection of resorts in the pristine South Ari Atoll, Amaya Kuda Rah Maldives had embarked on a project to restore the surrounding coral reef, which was also affected as a result of the 2016 El Niño. On acquiring the resort in mid-2016, Hayleys PLC of Sri Lanka realised the important role the island’s reef played in protecting the surrounding natural habitat. The resort partnered with Reefscapers Maldives, and commenced a coral conservation and regeneration project in March 2017. “With the personal commitment and initiative taken by our Chairman towards this project, we introduced their artificial coral frame reef system, which have been placed successfully since the year 2001 in several resorts in Maldives. The shape of the frames reduced coral predation and sedimentation and provided a suitable substrate on to which coral could grow. In addition Reefscapers also conducts awareness training to the resort team during their visits to increase awareness and taking ownership as well on our commitment,” Michael Armstrong, the General Manager at Amaya Kuda Rah Maldives, said. The coral frames are designed and made on the local island of Fulhadhoo in Baa atoll — a unique opportunity, started by Reefscapers Maldives, that provides employment for several local people and allows them to develop skills outside of traditional fishing. The transplantation process involves attaching coral fragments onto the metal frame, which grow and mature into new colonies. The fragments are collected from broken natural reef corals, and later harvested from own mature coral frames for the “second generation”. In 2017, the first frames were placed on the north-east side of the reef, and the growth rate has been amazing! In just two-three weeks, the coral fragments have attached themselves onto the frame. Two months later, new coral growth was evident and fish had moved in. Throughout the year, Amaya Kuda Rah Maldives’ on-property dive centre oversees the project. For every frame, the team at Divepoint Maldives follows a strict monitoring process, taking regular photographs of the coral growth, and identifying the marine life that starts to colonise the frames. By propagating the most successful species, the team is developing ever-more resistant coral offspring, better adapted to withstand higher sea water temperatures and so help the reefs in their fight against global warming. “The positive impact of the project has been seen over the past couple of years in the surrounding reef, as well as for the guest experience whilst snorkelling, due to the increase in the number of several fish species brought on by the new coral habitat provided by the coral farm. The ongoing work will surely enhance the guest experience further by providing a better snorkelling experience of the reef surrounding the resort island,” Armstrong said. Exactly two years since its inception in March 2017, the project has advanced into the second phase. With additional funding from Hayleys PLC and its subsidiary Amaya Resorts, more coral frames are being placed along the western side of the island, which will bring the number of frames submerged around the Kuda Rah island to over 70 in the coming months. The resort has plans to add even more frames to several other areas, including its main dive point and around the water villas. The programme is also now open to sponsorship. Guests can choose the size of frame and, if they like, dedicate it to someone special or put their own name on it. The Divepoint team will build the personalised coral frame and add it to the reef ecosystem. Sponsors will receive bi-annual photo updates of their coral frame via Reefscapers’ website. Proceeds from each frame go into an environmental fund established by the resort to support its marine conservation research programmes and community initiatives. Coral reefs are invaluable to the fishing and tourism industry — two major economic activities in the Maldives. They protect the shoreline from storm damage and help manage carbon dioxide levels. However, 60 per cent of the world’s coral reefs are estimated to be threatened due to human activity. The full extent of damage sustained by the 2016 El Niño is still unknown! Artificial reef projects have become an invaluable tool for restoring reefs and nurturing the damaged reefs back to health. With its ambitious initiative, Amaya Kuda Rah Maldives is leading by example. Amaya Resorts & Spa Kuda Rah is a beautiful, laid-back getaway that boasts a fantastic location in the heart of the South Ari Atoll in the Maldives. With a pristine beaches, a wide range of world class dive sites and the best of Maldivian hospitality, the 5-star all inclusive resort offers the finest in relaxation and luxury with the utmost privacy. The 41 rooms have one bedroom each, while the 10 x Family Duplexes have two bedrooms. The resort also houses two gorgeous restaurants, swimming pool and a beautiful island spa. Amaya Kuda Rah Maldives is located in Alifu Dhaalu Atoll (also known as Southern Ari Atoll). With whale shark and manta ray sightings almost guaranteed, South Ari Atoll is a spectacular destination for divers and snorkelers alike. Amaya Kuda Rah is located just minutes away from the famous diving site of Kuda Rah Thila. Add into the mix the atoll's many beautiful islands, ringed by picture-postcard, white sand beaches, and sand bars surrounded by limpid azure waters, and you have some of the most spectacular - and instagram-worthy - scenery in the Maldives. Each of the Crown & Champa Resorts is its private island paradise with sparkling lagoons, swaying palm trees and natural sandy beaches. 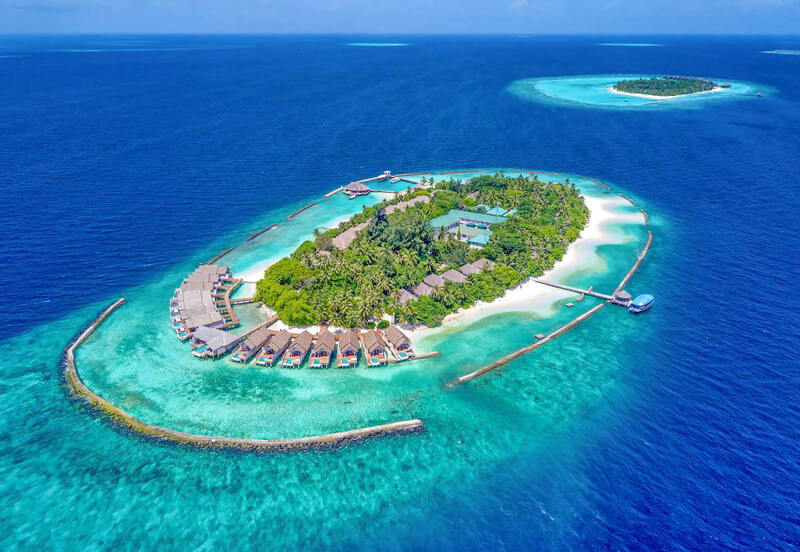 CCR was established in 2000 with a portfolio of 5 Resorts Read More Maldives is home to the famous over-water villas and beach villas, and you can wake up to a view of the crystal clear Indian Ocean or sun-kissed beaches, but which option is perfect for you? Read More Some of the best hotels and resorts in the Maldives are already included in this list, and the good part of them offers the best prices. We will constantly add new hotels, so regularly check for the best deals Read More..